Discussion in 'Serial Number Search' started by STL2266, Jan 14, 2019. It had been recanvassed and had the inside revarnished but never needed officially 'restored' prior to my Dad buying it. Because it was in such good condition and so very old even back then we were rarely allowed to use it because my Dad was afraid we might damage it. I distinctly remember my Dad always called it "The Old Town" and also remember that's what the man we bought it from in St Louis told us it was when we picked it up. Hopefully the attached pics will help to confirm that it's really an Old Town. End of happy part of story. Unfortunately the old log cabin it was stored in for the past 54 years has been severely neglected over the past 15-16 years and I was denied access to try to protect it. Thankfully that has now been resolved but a canoe that was museum quality 15 years ago is now severely damaged (although I believe it can - and will if at all possible - be rebuilt to it's prior high standard). The cabin has partially caved in on it now and the bow has been exposed to weather for probably the last 6-7 years. There is significant damage to one side just behind the front seat and although the stem and front deck appears to be fairly well preserved I'm sure the bow will have rot and mold issues and that there will be miscellaneous rib fractures and planking issues in areas besides the area that was crushed. Fortunately, most of the rest of vessel appears to be preserved due to support of the roof of the cabin by other things keeping weight off the canoe except at the one crushed area. Thankfully the roof over everything but the bow has somehow miraculously remained waterproof despite caving in. The pics will tell the horrible story of what happened to this beautiful canoe. Sorry they're not a little better but it was sorta scary climbing in there and under it even only as far as I did! Sure wish I would have been allowed to get it out of there 10 years ago. I just don't understand how anyone could have allowed this to happen - never will I guess. Doesn't matter anyway, the important thing is that it's going to be loved and safeguarded from now on! I know (sadly) it's last 50+ year history, but if the factory build sheet might be available it would be wonderful to find out for sure when, how and where it started life. Thank you all so much for the help, I'm sure I'll be asking for more as I progress. Hope the pics are OK. Thanks Tom, appreciate the encouraging words! I'll try to get out there and snap some more pics in the next few days. If I remember right there used to be a decal on the front deck that had Old Town on it but it's been a loooong time since I've seen it, hope the weather exposure hasn't taken it. The thing about this canoe that stands out (other than the very low SN) in your pictures are the slatted seats. Those were only associated with Old Town canoes built during the WWII period. The low 2266 SN would be found on an Old Town built pre-1900........not a canoe from the 1940's. Benson's suggestion that the canoe is not an Old Town makes sense. Pictures of the decks would be very helpful. Thank you for the info and encouraging words! Wish I could remember what the front deck looked like for sure but the picture in the St Louis Meremac ad sure looks familiar. I had also been wondering about the seats as pretty much everything I had seen researching Old Towns looked like they used wicker. Since we got it in St Louis too everything fits pretty well and it makes sense. I'll make it a point to get back out to the woods and take more pictures in the next few days. You guys are really GOOD! Got some more pics yesterday, will post a few. I don't want to hog up server space so if anyone wants any more in particular just let me know and I can always add. Might be best to wait and see what things look like after it's extricated from under the debris of the cabin. 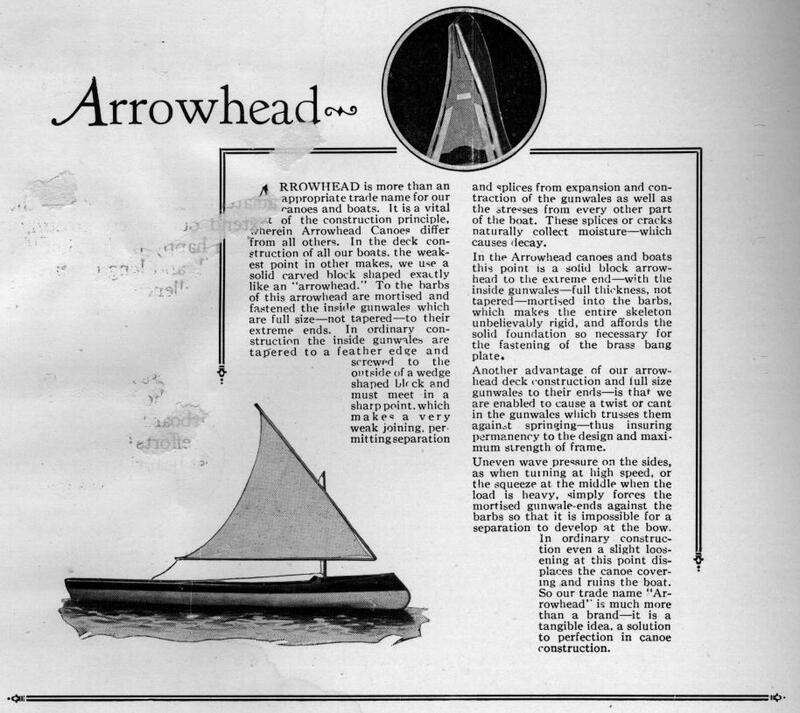 My canoe definitely has the arrowhead deck that is identical to a pic on the 'dragonfly' website for the St. Louis Meremac/St Louis Canoe canoes. Figured mine is a mid-1940's era build from the serial number & other info provided here. No decal left on the exposed end for sure. Couldn't get inside to get a really good pic of the deck that's been protected but don't think there's any identification decal left on it either. Did see that serial numbers match on both ends. Also noted it has external stems, full length bottom keel & no interior full-length keel board (not sure what it's really called) but does have the short ribs on the bottom between the full ones like the pics on here & dragonfly of the St Louis canoes too. Got a couple (not so great but best I could reach) pics of the rib fractured/crushed area too. Thank goodness that angle iron bedframe was where it was to support the log roof truss! Apologize that I didn't get any measurements. Drove 25 miles to get there, then walked through woods thru snow for 1/2 mile and then realized when I got there I forgot my tape! I believe the damaged area I was describing as the bow in my 1st post is actually the stern as the seat position is much closer to the deck/stem on that end than the end that is protected. Sorry not better at describing things, I'm a canoe "newbie" - but ready to learn! 1. Protected end, outside, probably Bow (pic upside down). 2. Protected end, inside/deck, probably Bow (pic upside down). 4. Exposed end inside view floor, ribs, stem, underside deck & rot where gunwales meet deck & stem. 6. Crush area view from stern. 7. Crush area view from bow (Pic rotated 90 deg counterclockwise). 8. Crushed area from outside. 10. Exterior of stern w/bang strip, exterior stem pulling away & rot. Decking still looks decent. Thank you again! Sure nice to know there are such knowledgable and helpful folks out there in the canoeing world. I have been amazed by how many different manufacturers and subtle differences there were in the wooden canoe industry over the years. I had no idea. The diagram is very helpful too! If he is open to the idea I'm hoping I might be able to get in touch with Mr Hauck sometime for a few minutes after I get it rescued as I'm only about 60 miles from St Louis. There have been several hundred wooden canoe builders in North America since the late 1800s. The list at http://wcha.org/catalogs/maine-list.htm confirms 190 in Maine alone. You are fortunate to have a canoe built by someone that can be identified. I sent an email to Wally Hauck about your canoe yesterday morning so he may contact you directly or respond here soon. Just realized now I need to figure out how to change my username! What if there's a REAL Old Town 2266 out there somewhere? What if there's a REAL Old Town 2266 out there somewhere? There is no build record available to confirm the Old Town with serial number 2266 if it does show up. The nearest record is for number 2265 as attached below. Number 2781 has surfaced as shown at http://www.wcha.org/forums/index.php?threads/2780/ but it had the remains of a decal on the deck to identify it. It is probably easier to just create a new account and stop using your old one rather than change the username. Interesting that OT2265 was built in 1904 but not shipped until 2 years later to Macy's. Filler takes a long time to dry so canoes were often stacked floor to ceiling and wall to wall in large storage areas. This would mean that the first ones in were often the last ones out. The Old Town Canoe Company would even occasionally store canoes on the roof once the store rooms filled up as shown in the picture at http://www.wcha.org/forums/index.php?attachments/16704/ for example. The charts at http://www.wcha.org/catalogs/old-town/oldtown_chart.html have some large horizontal spreads which indicates that long production delays were not unusual. One Old Town appears to have been built in the early 1960s and didn't ship until the early 1970s. Looks like I've stumbled into quite an adventure. First of all, the challenge of rebuilding mine and secondly finding out about the world of canoes and the folks involved in their creation and care. Looking forward to both - ought to be lots of fun! I can easily change your username, just let me know what you want it to be. Thanks Dan! If it's a St Louis Canoe for sure (& it sure looks like it) how about STL2266?